Please ensure that all your certifications are on file and up-to-date before applying for a Job. Please Click Here to email any/all required certifications. Please see Future Members for a list of tools needed for work. We have received notification that the remittances from Astaldi for July and August have been released and forwarded to the Trades Council. They will be forwarded from there to the locals and we should receive them next week. October’s is still being worked on and will follow when process is complete. Good Day To All: Effective Jan 1st,2019, I am asking all members to ensure that all safey / other certificates are up to date on your personal file at the hall. It is your reponsibility to ensure this information is up to date and on file. Failure to do so may result in you missing an opportunity to be referred for a job. 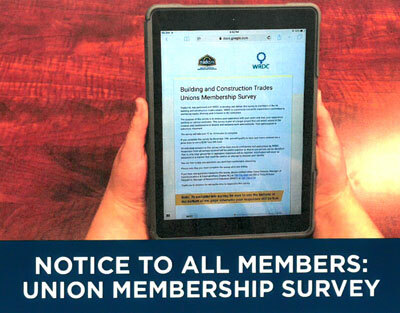 A reminder to members that , under Article XV, General Laws (bylaws) Sec 19, Members shall not solicit work at the electrical construction trade or accept employment at the electrical construction trade unless granted permission by the Business Manager. As such, forwarding resumes to our contractors and contacting same is in violation of our General Laws and, under Article XXV, Sec 1 (a), a member can be penalized for such practice. Please judge yourself accordingly. We do not want to penalize members but will do so if this practice continues. This is to advise Members that T4's are available online. Login to the MEMBERS ONLY area with your Card # and password and within Account Information, click to Print your T4. This is to advise that any member requesting a lay-off from a job prior to its completion or normal lay-off period will not be provided a referral for another job for a period of 6 months. This is effective as of February 25 2019. Moving forward from this date, February 15, should a question arise regarding the residency of a member, only a members name on a voters list or tax roll will be accepted as proof of residency within a geographical area. Members requesting vacation pay are asked to have their request in by Tuesday of the week for which they are requesting vacation pay. Vacation pay cheque’s will be available for that Friday for pickup by members. Requests made after Tuesday cutoff can not be processed until the following week. This section is exclusive to Local 2330 members. Log in to update your profile and access your hiring list number. Our Text Update subscription page is now live! Log in and visit the SMS Subscription page to apply.